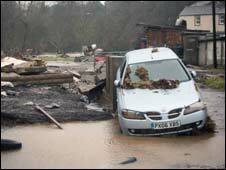 A shed bobbed past Gemma Carter's window as the water gushed into her home. This was the second time in just over a year that the property had flooded - she knew her mortgage was now all but worthless. It was Gemma's 32nd birthday. The house she and husband Hugh had spent months lovingly redecorating was ruined, but two of her friends came to celebrate regardless. They retrieved a bottle of beer each from the fridge floating in the utility room, climbed upstairs out of the floodwater, stripped off their sodden clothes down to their underwear and toasted Gemma's good health. It was, Gemma says, one moment of happiness amid the chaos and wreckage. 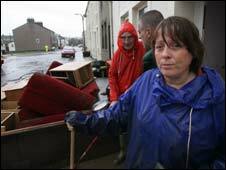 But now, like so many of her neighbours in Cockermouth, Cumbria, she is faced with the task of rebuilding her life. "I don't think there's any chance of selling it again," she says, looking around the home in which she invested so much. "Huge mortgage. Probably not insurable." The property flooded before in October 2008 - just two months after the couple moved in - but Gemma recalls: "We didn't actually have our own stamp on the house. It wasn't decorated to our taste. "This time the whole house has been done up. Everything's brand new. It was starting to feel like home. Gemma is angry that local flood defences were not strengthened after previous incidents, and her next-door neighbour Sue Cashmore, a 49-year-old lecturer, agrees. Sue spent Thursday night in an upstairs bedroom with her two daughters, two dogs and cat because the ground floor was immersed in 6ft (1.8m) of water. As they waited for a Royal National Lifeboat Institution boat to arrive, a greenhouse and a dead sheep floated past them. Having been through all this twice before, Sue knows the real battle lies ahead. "The water is the easy bit," she says. "You have to fight to get the insurance to be paid. "Your whole life has changed, everything you take for granted is gone. "We've lost the infrastructure of this town. We've lost all our shops, banks, pharmacies. It's going to take a long time to recover." True enough. Main Street - Cockermouth's normally bustling thoroughfare - looks as if it has been carpet-bombed. Sandbags scatter the pavements. Furniture piles up in the road. On one side, a kayak lies abandoned. For a town centre in which the vast majority of shops are locally owned, it is difficult to imagine how the effect on the town's economy can be anything other than devastating. 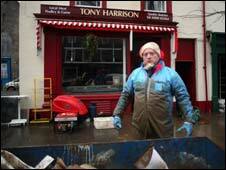 With a mask over his face and heavy overalls on, butcher Tony Harrison, 40, is throwing away piles of meat left inedible by the floodwater. "I probably had about £10,000 worth of stock," he whispers. "It's all in that skip, all wasted. "To spend 22 years building the business up and then all of sudden it's taken away like that - it's destroying.
" He pauses. "It hasn't been very good." Now, however, Tony insists that he has picked himself up and is getting on with the job in hand. He believes the government and local authorities need to lend their assistance if the rest of the area is to do the same. "If we get plenty of funding, which is what the town needs and what the shops need, we'll get back on track," he says. Joe Fagan, licensee of the Bush pub across the road, agrees. 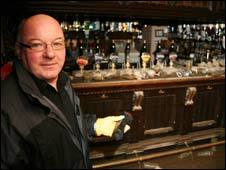 He has just been told his premises need a complete overhaul and the earliest he can expect to reopen is Easter 2010. "Absolutely everything is ruined," says Joe, 57. "The whole pub has got to be completely refurbished. It's absolutely heartbreaking. "But what I really need now is guidance. How to deal with all this. It's advice that we really need." Outside, the rain continues to fall.